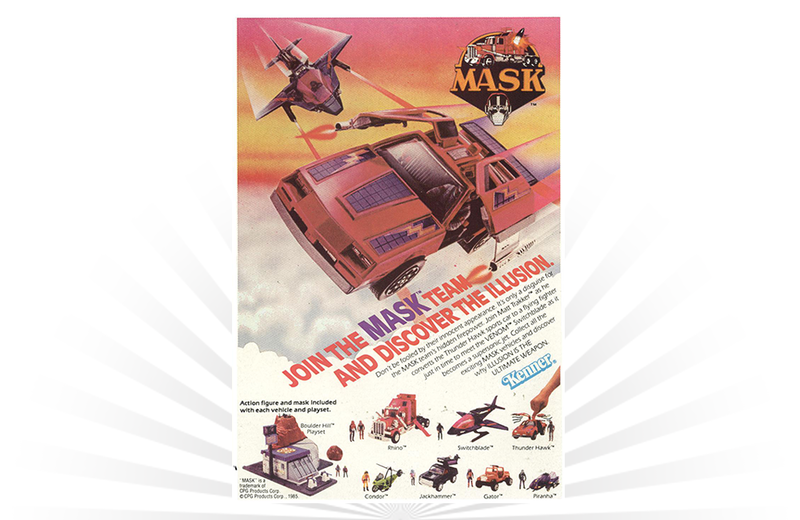 Developed by Kenner in 1985, MASK (Mobile Armored Strike Kommand) was a line of action figures and vehicles that initially tied into an animated television series of the same name. Led by founder and leader Matt Trakker, MASK did battle against a criminal organization known as VENOM. (Vicious Evil Network of Mayhem). Under the tagline “Illusion is the ultimate weapon,” vehicles developed for the toy line could transform to reveal hidden weapons and gadgetry. Kenner released four series of toys until MASK was discontinued in 1988. This vintage ad depicts vehicles and a playset that represent collectibles from series one of the toy line. Hasbro has shown renewed interest in reviving the brand. Rumors of a MASK feature film have made the rounds, and publisher IDW is set to debut a new comic book that will serve to reboot the franchise. The Supervator Super Action Flyby from MEGO was one of the more peculiar offerings for everyone’s favorite wall-crawler.